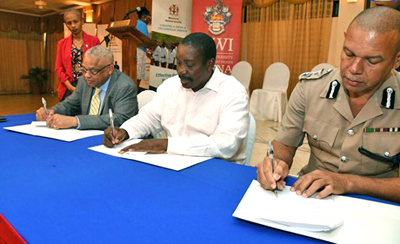 National Security Minister, Robert Montague (centre) signs a Memorandum of Understanding for the Mona Campus of the University of the West Indies (UWI) to train Jamaica Constabulary Force (JCF) recruits, at the University’s campus. Others (from left) are UWI Campus Registrar, Camille Bell Hutchinson; Pro Vice Chancellor and Principal of UWI, Professor Archibald McDonald and Deputy Police Commissioner, Clifford Blake. The complement of the Jamaica Constabulary Force (JCF) should be boosted to 14,092 following the signing of a Memorandum of Understanding (MOU) by the National Security Ministry, the JCF and the Mona Campus of the University of the West Indies (UWI) to have more officers trained. Under the MOU, the UWI will facilitate the training of JCF recruits with an intake of 300 every six months over three years. A section of the campus has also been designated to house the recruits. While at UWI, the recruits are expected to partner with students from various disciplines, including social work, human rights, crime-scene investigation and technology. Addressing stakeholders at the signing ceremony on the UWI’s campus on August 17, National Security Minister, Robert Montague, said the training spaces provided by UWI are, in addition to others, being established. “We will have 700 between Harman Barracks and the National Police College of Jamaica in Twickenham Park when repairs are completed. With the university coming on board with 300 spaces, we’re up to 1,000. Next year, we are proposing to (train) two batches for the one year…; we will be able to train 2,000,” he said. Additionally, Mr. Montague noted that discussions are being held with China Harbour Engineering Company (CHEC) for donations of three of its prefabricated buildings along a section of the North-South Highway. “One will be going to Harman Barracks that can house 84 additional trainees and one is going to the National Police College, which can house 124. The other one will also go to the College,” he said. Mr. Montague estimates that with all these initiatives, within two to three years the JCF will have its established complement of police officers. Meanwhile, Deputy Commissioner of Police, Clifford Blake, expressed sincere gratitude to the National Security Ministry and the University of the West Indies for creating the opportunity for the Force to bolster its numbers. Mr. Blake, who represented Commissioner of Police, George Quallo, lamented that the Force continues to struggle with attrition. He noted that, at present, approximately 11,433 police officers are in the Force, which represents a deficit of nearly 3,000. “In 2015, we graduated 244 persons, and during that time, 514 persons left the organisation through resignation, retirement, death and dismissal. In 2016, we graduated into the organisation 495 persons. Last year, 544 persons exited the organisation. We continue to operate at a deficit,” he said. For his part, Pro-Vice Chancellor and Principal of UWI, Archibald McDonald, said that strengthening the complement of the Force will see a police to citizen ratio of 46.6 officers to every 10,000 Jamaicans. This, he noted, would put Jamaica on par with major cities such as New York, “a city with a population of nine million citizens with a ratio of 44.5 police officers to every 10,000 citizens”. 1. Could the pool of officers come from “qualified for the Police Force” students unable to complete University degrees due to financial constraints? 2. Graduates with degrees unable to find EMPLOYMENT can could add value to the Police Force? 3. Existing students who wish to transfer to the Police Force programme? 4.Students who owe funds but who could qualify join the Police and have income to pay back the univeristy? 5.Can students who have made investment into the university be assured of employment and have access to housing and nutrition at reasonable costs as the Police cohort in training? a question though that I hope you could answer.